Indulge Yourself! 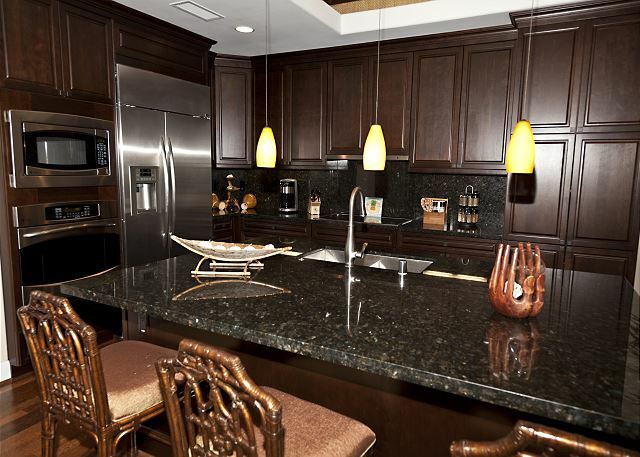 Five Star Resort Living with the Advantages of Home. 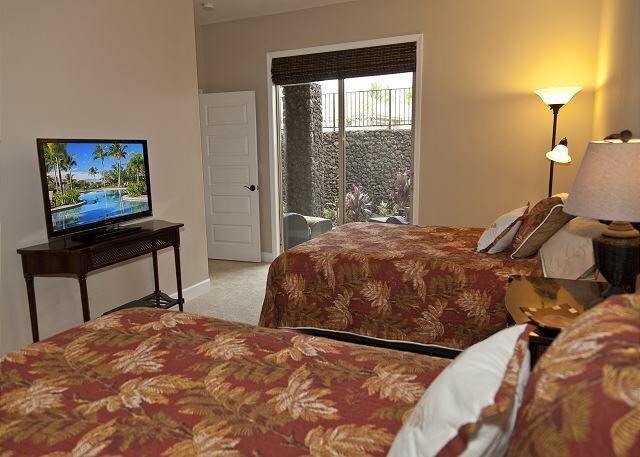 Step into your Aloha home away from home and feel the rest of the world melt away. 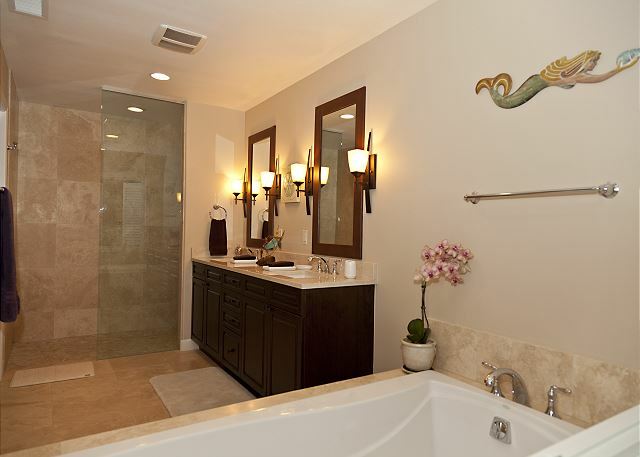 This beautiful home has it all - almost 2500 square feet of indoor living including a fully equipped gourmet kitchen with granite counter tops, stainless steel appliances, and coconut wood flooring. 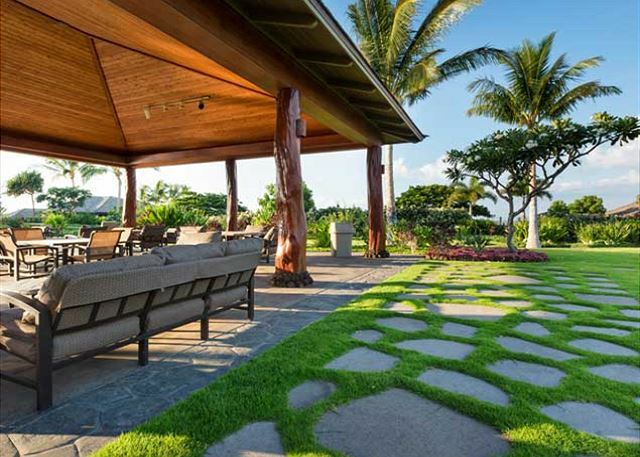 Open up the living room pocket doors and relax on the lanai as your steaks sizzle on the built in barbecue: or enjoy a tropical libation as you lounge on any of the three outdoor living areas. 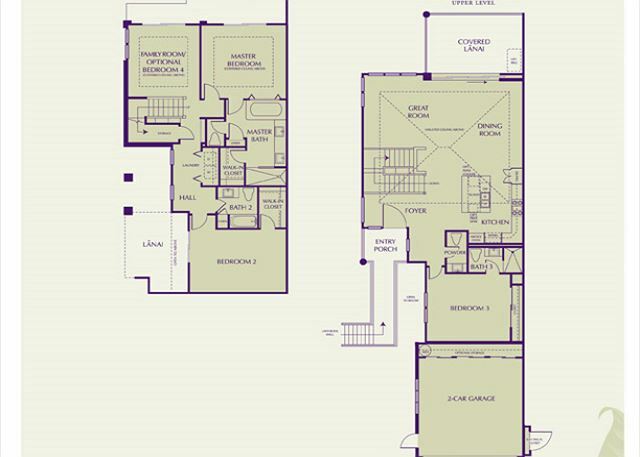 This new 4 bedroom/3.5 bath home offers every luxury you can imagine. 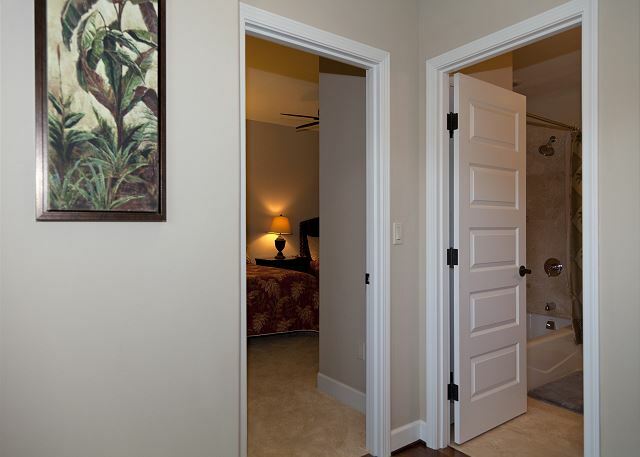 Two master suites with king size beds - upstairs master offers walk-in stone shower in en-suite bathroom. 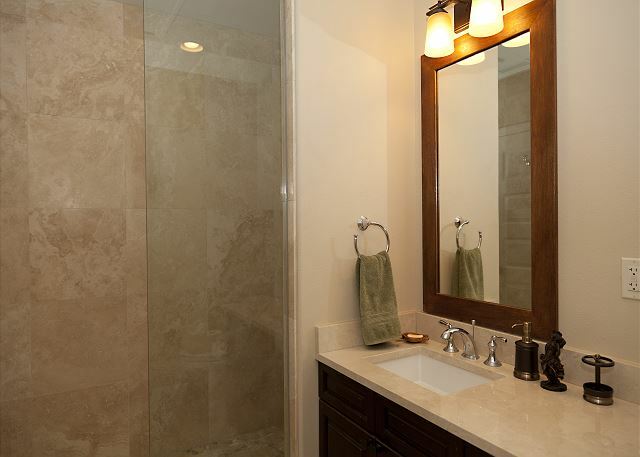 The downstairs master has a full en-suite bathroom with walk-in closet, stone shower, soaking tub and private patio. 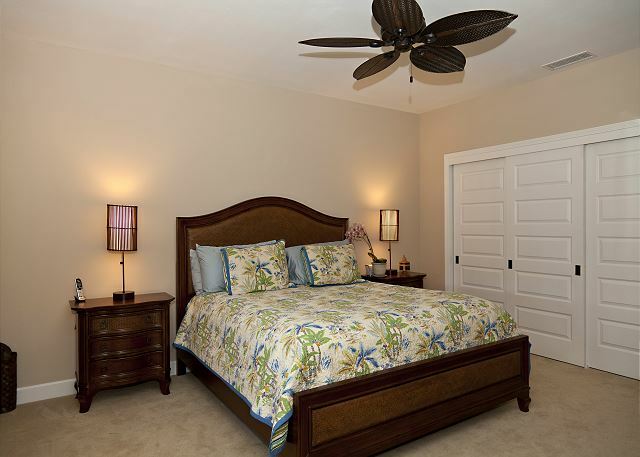 The third bedroom is over sized with two queen beds, and the fourth bedroom has a queen bed. 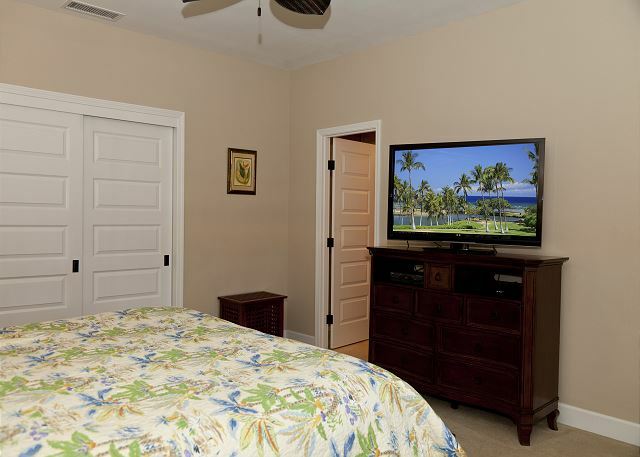 Tropical decor and large flat screen TV's compliment every bedroom. 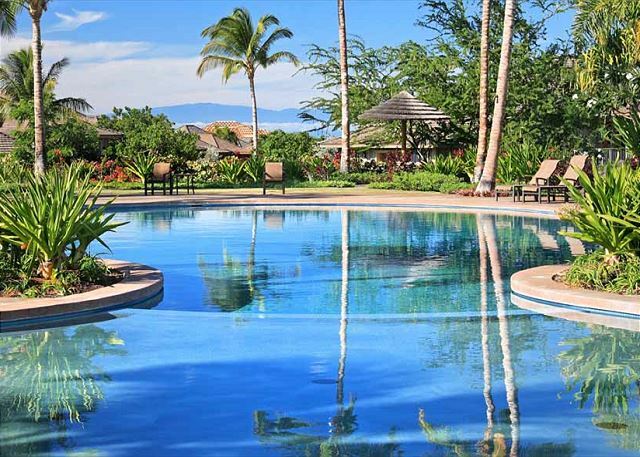 A secret gem of the Mauna Lani Resort, the 3 acre KaMilo/Kulalani Recreation Center, is a short walk (about a 9 iron) from your Aloha home, and offers a lap pool, large free-form lagoon pool, kiddie wading pool, two Jacuzzi spas, workout building with free-weights, exercise machines and showers with lockers. There is an incredible pavilion next to the lagoon pool where you can gather with family and friends by the Viking grill and outdoor kitchen to host parties and special events. Read a book or take a snooze in one of the dozens of cabanas available for the guests of the resorts. 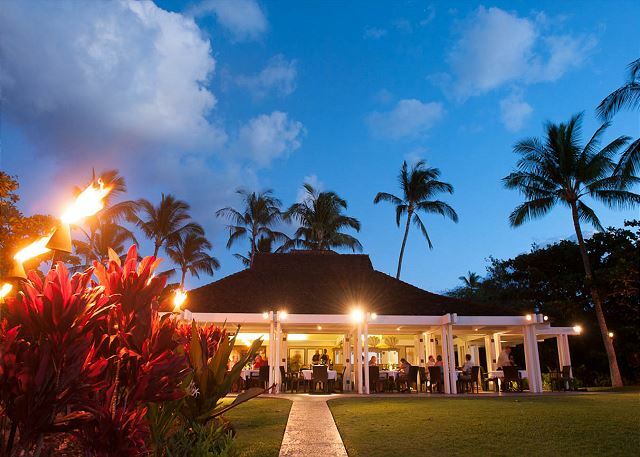 When thirst or hunger call, a full-service restaurant awaits mere steps from the beach and will tempt you with a tasty menu and specialty tropical beverages as you soak up the ocean views and the occasional breaching whale. Ancient Fish Ponds are adjacent to the Beach Club, where you can spend hours studying how the ancient Hawaiians farmed the local fish. 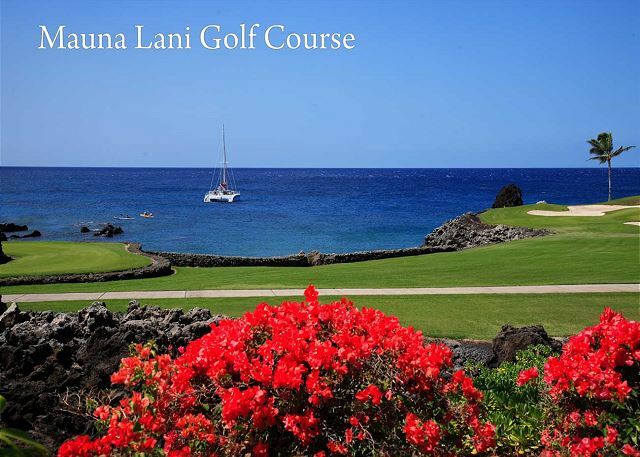 Other attractions include the 5 star Mauna Lani Bay Hotel and the Fairmont Orchid Hotel. Both hotels are within walking distance and offer access to our guests, and most importantly our two award winning golf courses. A quick walk down the street will take you to 'The Shops'. Discover The small gourmet market (Foodland) with delectable deli selections, freshly made sushi, deli and bakery. 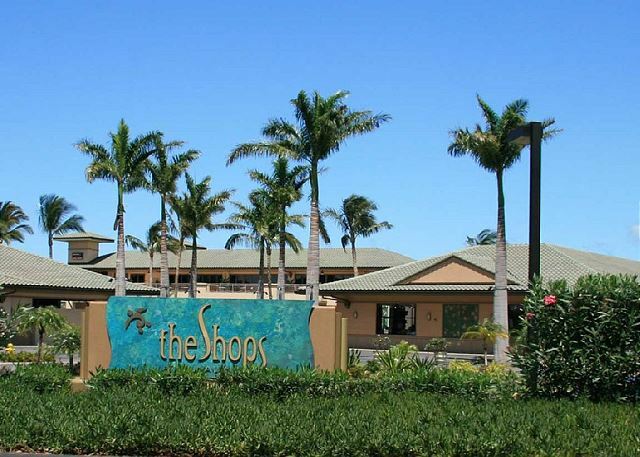 There are a number of first rate restaurants, including Ruth's Chris, Tommy Bahamas, Monstera, Kimo Bean Coffee and other great restaurants. 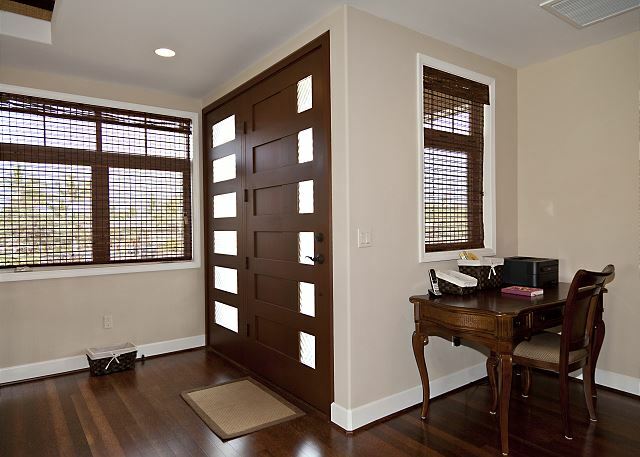 This premium Luxury rental is in high demand. Don't hesitate and be disappointed. Check the calendar for availability then contact us today. Don't let your travel dates get scooped up by other happy travelers. Our vacation rental experience was superb. The house exceeding our expectations, was plenty big enough for our large party, and was very clean. The management company went above and beyond to make our stay easy and convenient. I would definitely stay here again! Our 2 adult children, their spouses and 2 grand daughters joined us for this wonderful vacation. The layout of the house was great! 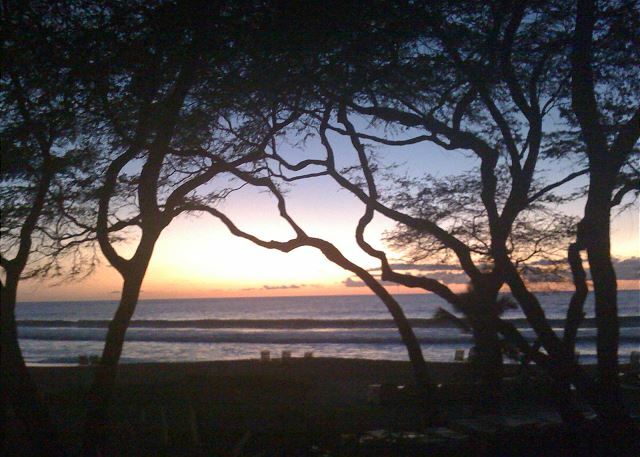 What a perfect place to make memories and share the big island. The Shiwota family was amazing to deal with! They graciously took our phone calls about the dryer not working (It WAS working, I just couldn't figure it out), to concerns about an overloaded freezer (again our issue) and finally we forgot the garage door opener in the rental car (which they tracked down and retrieved). I will hopefully be able to return again to this amazing property! 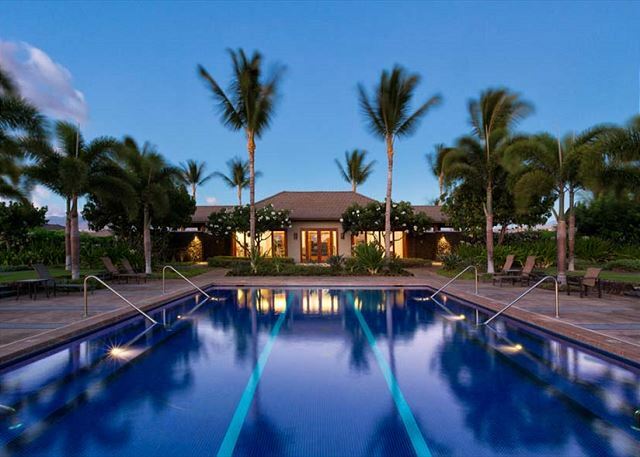 Not only is it near all our favorite beaches, but the beautifully landscaped property and pool were very relaxing. Thank you for sharing with us! There is simply not enough to say about this amazing vacation rental. From the exceptional customer service by Shig and Mike to all of the thoughtful supplies and equipment available at the house. The beach toys, wagon, chairs, umbrellas and the fully stocked kitchen made our trip so easy!! 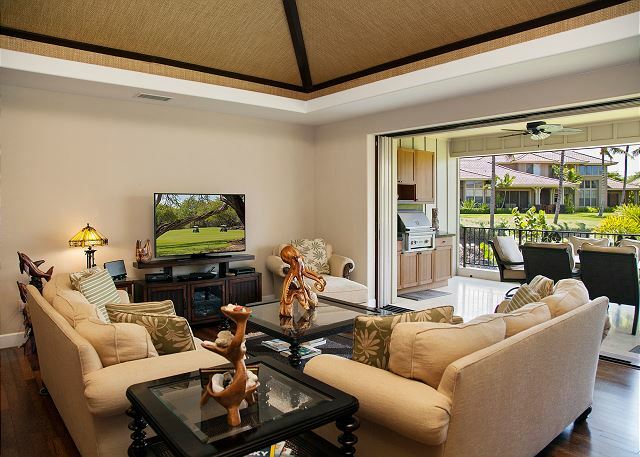 The house itself is beautiful and the large lanai that opens up to extend the living room gave our group ample space and an incredible indoor/outdoor living feel. Access to the ocean club was great for late afternoon beach trips and the pool area and hot tub were superb. Clearly, we had the best time and we will for sure be back! We had 6 adults and 4 little kids and all had plenty of private space when needed. Big thank you to Mike and the whole team! Mahalo! The house was perfect for our group, 6 adults. We were in Hawaii for a wedding at the Fairmont. Very close to the hotel. Lanai was wonderful for breakfast and Happy hour. Perfect place to relax, clean and beautiful. Great base location. 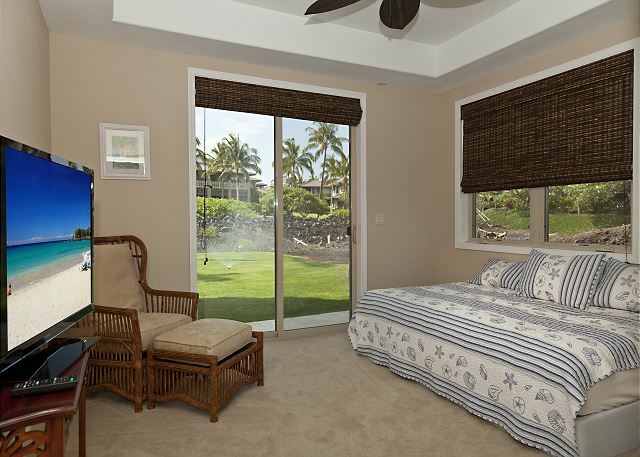 Rental includes parking access to one of the best snorkeling spot on the island at Mauna Lani Beach club. Go there! Also, the best beaches are a short drive away! Very good for family or a group of friends. Great location. Pool and access to beach club (short drive) wonderful. Home and furnishings attractive and in good condition. Protect manager easy going, helpful and very responsive. My family if 6 adults and two children had a wonderful time. Lastly, a small full service market is a very short drive and open 6 am to 11pm. This proved very convenient. 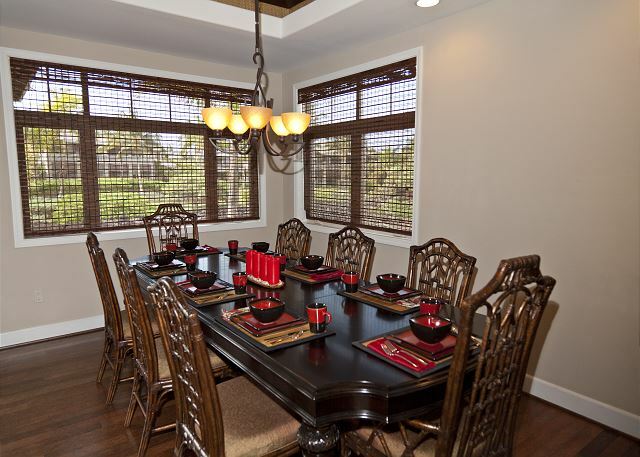 The layout is perfect for up to 8 people. There are a lot of locations to hang out or eat. TVs in every room on Netflix, the AC was wonderful on the hot days. 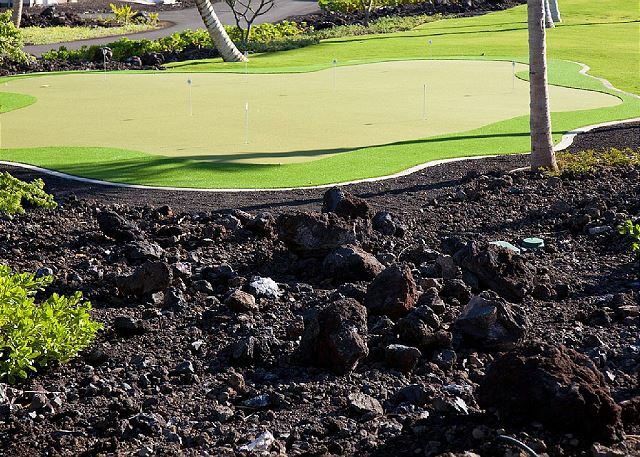 The yard backs up to an old lava flow so you never forget you are on the Big Island. 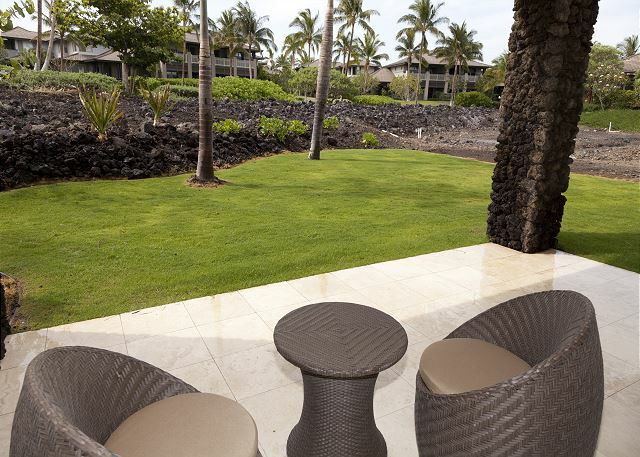 Each morning the breeze rustled in the palms as we drank coffee on the lanai. The beach resort was nice for some SUP and snorkeling and the local shops and groceries made everything convenient. I would definitely return to Kamilo. We had a fantastic time in Hawaii! The house was amazing and perfect for our large group. Close to beaches and shops. Thank you for everything! We had an amazing trip with friends recently for the Honu 70.3. The property and manager were phenomenal. No complaints only compliments. We loved our stay at Kamilo. 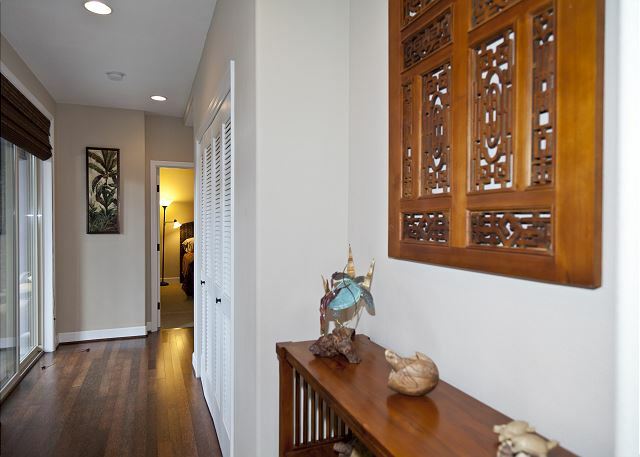 The house is very comfortable and located in a great area. A 2 min walk to a very nice pool, close to shops and to the beach. Lots of space for our family. Exactly as described- clean, spacious, comfortable, well-equipped. 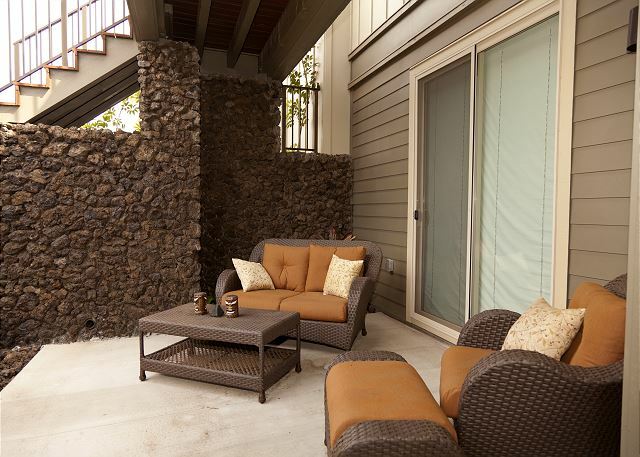 We enjoyed the indoor and outdoor spaces and the location. We would definitely stay here again. We had no issues and never needed to contact the rental company, everything worked perfectly. This house was very well furnished. Location is not on the beach but is near by. Overall, we were very pleased and would recommend it for a group of 8 to 10. We were not sure of which beaches were available, but the owner was very helpful when contacted. I would recommend documentation on beaches and how to access them. The Kamilo 110 was a perfect house in a perfect surroundings for our family vacation. We have 9 people from 9 year old to 70+ and everyone enjoyed the stay and the activities around. The private beach was excellent, very relaxing place as well as the swimming pools in the resort. 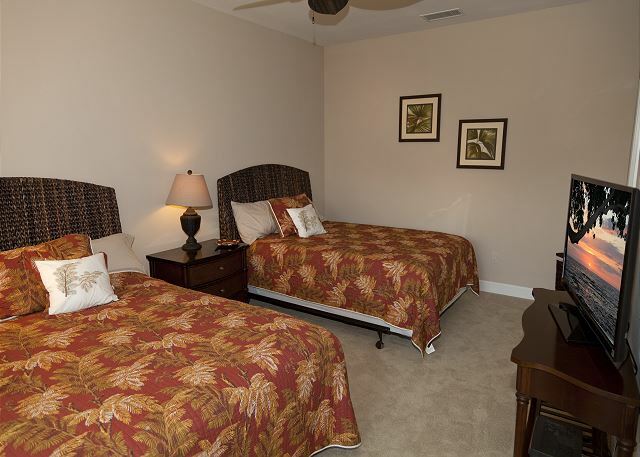 This unit has 4 bed rooms which fit us very comfortably. The management was very friendly and professional and really made feel like home. We stayed 7 days and everything lived up to our expectations . We already recommended to a couple of friends for their next family trip. Wonderful house. Clean, well laid out and comfortable. 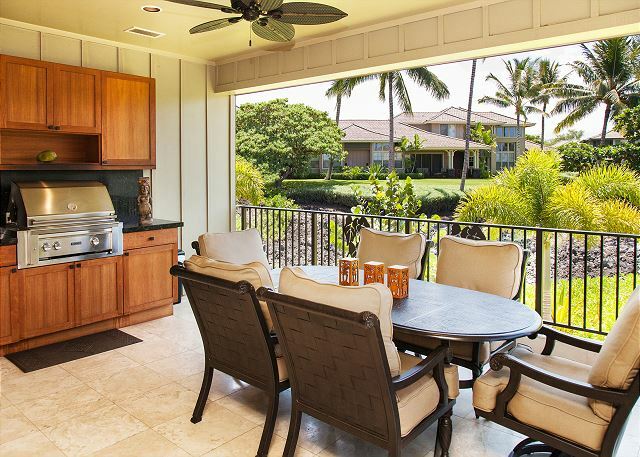 Opening door on Lanai was great. Shig was very helpful! We had a great time in this beautiful home. The service and property management was excellent. We had trouble with the grill and the property manager had a maintenance man there that day. The house is just down the street from the community pool which is really nice. 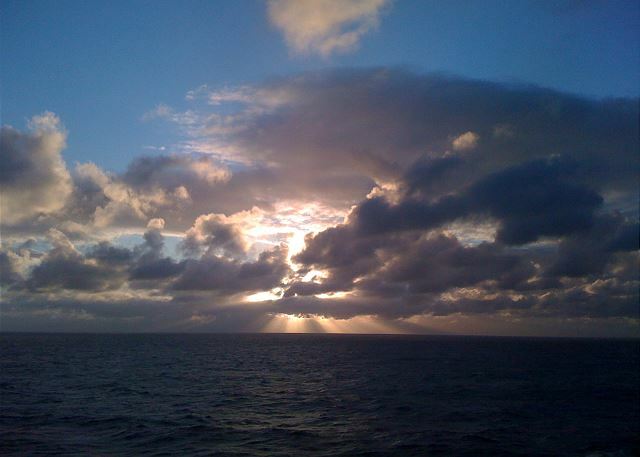 You won't regret staying in this beautiful area or home. The home was perfect. It was exactly as the pictures indicated. Even better. There were a few minor items that came up during our stay but were dealt with immediately. 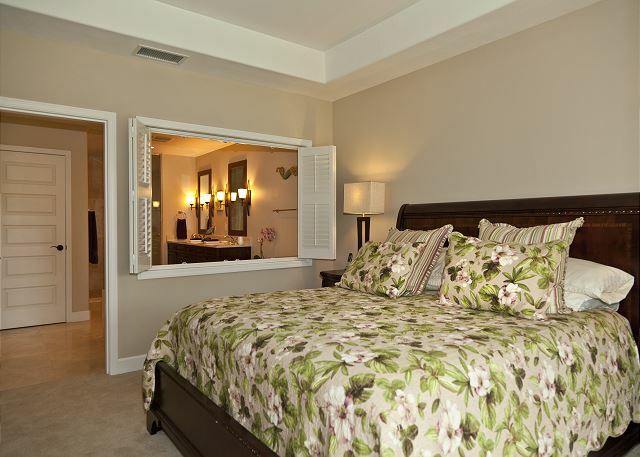 The location is great close to a great beach and lots of shopping and dining spots. I would stay again. 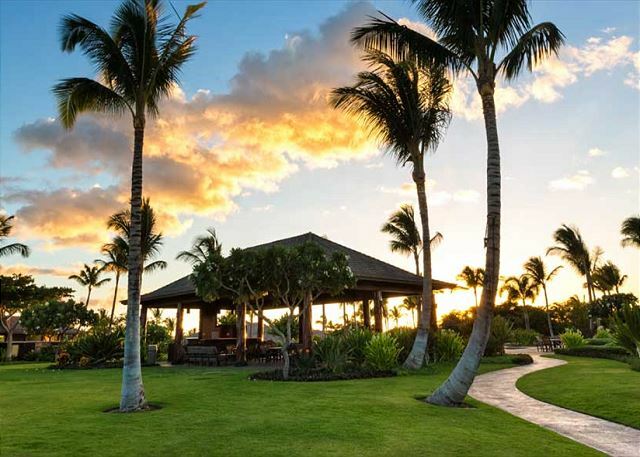 Bringing family together to experience the beauty of the Big Island was enhanced by our first experience at KaMilo. Our arrival at our unit 110, was filled with delight! 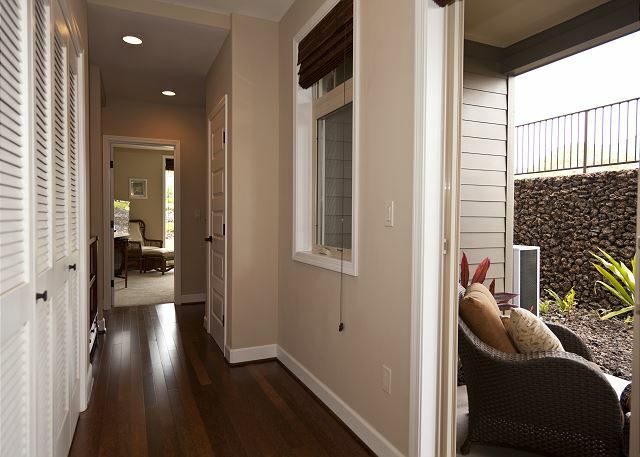 Those of our family who arrived early had so much fun deciding on which of the four bedrooms we would choose! 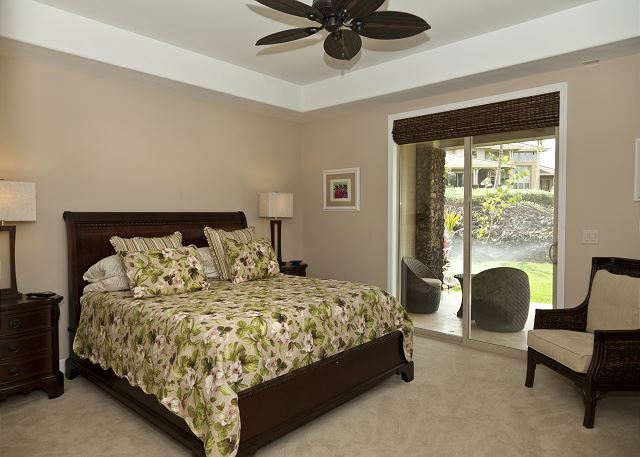 We loved the fact that one of the two master bedrooms was upstairs. The kitchen was well equipped and after a trip to Costco and the local market we were able to share several delicious meals using the barbecue. Some of the highlights our trip included a dolphin swim, horseback riding at sunset, snorkeling at the private beach and a drive to Hilo to have the helicopter tour called "Circle of Fire!" Three of our brave vacationers also did the Manta Ray excursion! The Fairmont Orchid was so close by, we were able to enjoy the beautiful lagoon and the abundance of sea turtles. Oh! and the golf for the guys was great at the Frances Brown golf course at a reduced rate. One restaurant we enjoyed owned by a local was the Plantation Grill in Kawaihai. Highly recommend! We had 10 people from 3 generations staying in this great house. 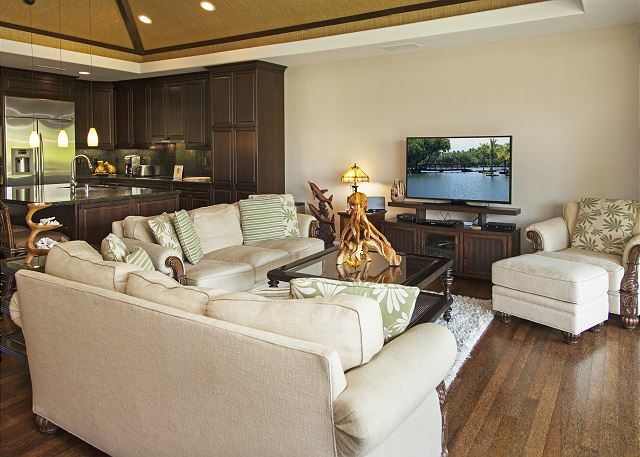 The house itself is well furnished with high end furniture and appliances but is still kid-friendly at the same time. The kitchen was well stocked with everything we needed and we used the outdoor grill almost every day. There was a lot of beach gear for the kids and the adults - so much that we never even used a lot of it. The unit was spotless. These units are very well built. Even though we had a neighbor in the other half of the townhouse we never heard them at all. When we did have a couple of minor issues like the grill running out of propane and problems with the gate into the community, the property manager, Shig, who lives in the complex, took care of them immediately. 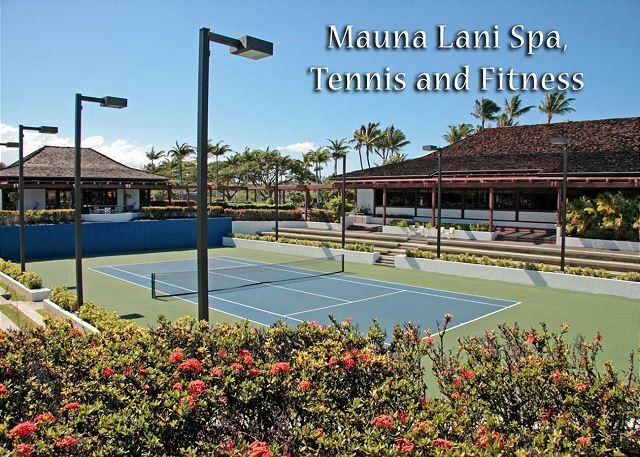 One of the main reasons we looked pretty much exclusively in the Mauna Lani development was access to parking at the beach club. 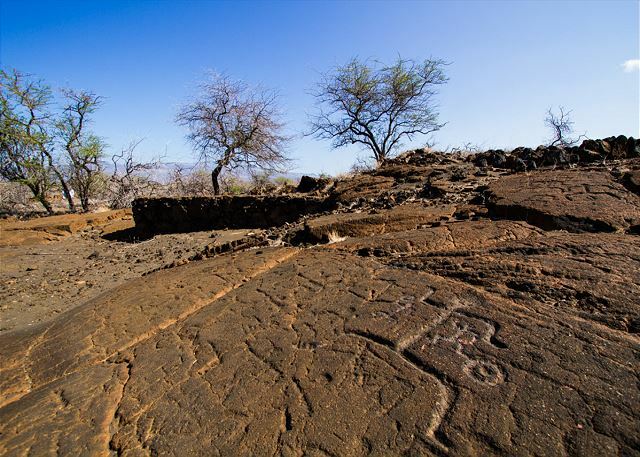 This location is pretty central on the South Kohala Coast and we did visit other beaches from Kukio to the beach at the Mauna Kea, none of which were more than about 20 minutes away. 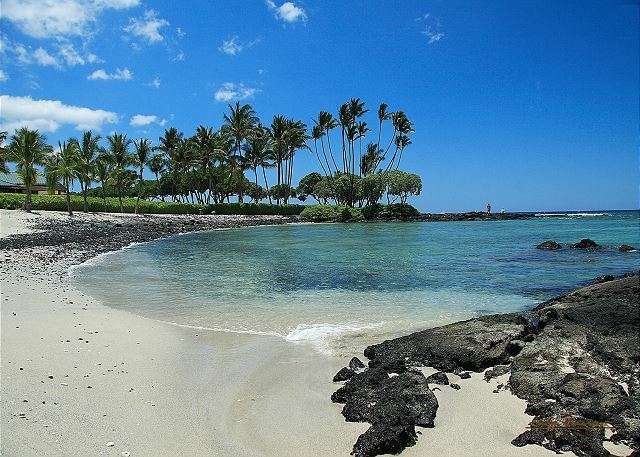 But Makaiwa Beach at the Mauna Lani did end up being our favorite place to go since it was great for both kids and adults and we could do pretty much everything we wanted to do there. So it was really nice to be able to park so close. 1. Although the internet speed was pretty good, the strength of the wi-fi was very weak. Sometimes it wouldn't even work in the upstairs bedroom which was only 30 feet from the router and it rarely worked at all anywhere downstairs. 2. The washing machine was quite noisy which made it hard to wash clothes at night while the kids were asleep. 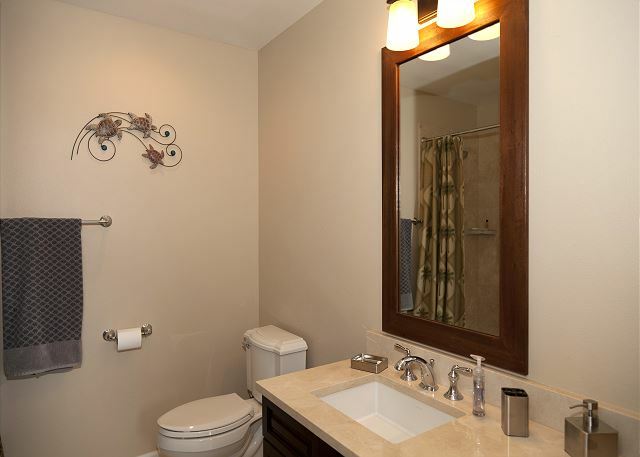 Overall this house worked out great for us and we would certainly rent it again if we had a large group. Beautiful home lots of space for family of 7. The only suggestion I would give the owners:not enough hot water at times.There is a large soaker tub that I ran out of hot water trying to fill.Also there is a policy that you can not hang beach towels on rails outside the house.This needs attention,we constantly had wet towels and had to bring them in the home to dry which brought slot of sand into the house.We had no idea where to bring the recycling and where in the home did it tell us so we had to call the property manager.Also I would suggest to the owners to set up somewhere in the house to store recycling like large plastic bins?There was no where to put it in the home.The TV 's were confusing.The wifi was very weak in the home and one of the rooms downstairs had no wifi at all.There are not major things just merely suggestions that would have improved our stay.We would absolutely come back to the home we loved it there!our property manager very friendly, helpful and prompt. 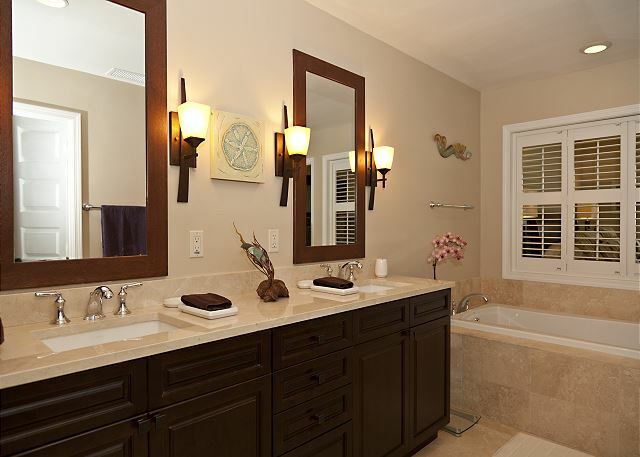 The location was great.The home was clean and well stocked. We loved this house. We had 4 couples and were able to sit on the patio to have meals or in the house for football or games. It was very clean when we arrived. 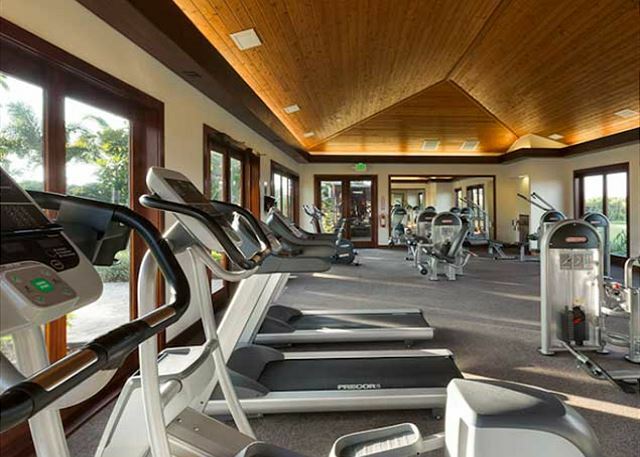 There are sites and a pool to walk to from the resident and a private beach club with a beautiful beach within minutes drive. We would stay here again.